Metal Fabrication Equipment, Machine Tools, MORE! Wednesday, January 21 begining at 10:00 AM EST. The photographs posted here are a small sample of what is available in this auction sale. 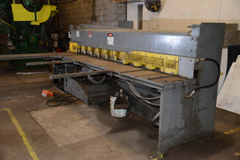 HIGHLIGHTS OF THE AUCTION INCLUDE: Cincinnati 12' press brake, Niagara 10' Hydraulic Power Squaring Shear, Chicago Press Brakes, Lown B-700 8' pinch roll, Milton 8' pinch roll, 24" pinch roll, Producto Hydraulic Corner Shear, welders, supplies, hand tools, much more! NO WARRANTIES: Everything in this auction sale is sold “AS IS, WHERE IS and WITHOUT RECOURSE. There are no warranties, guarantees or representations of any kind or variety, whether expressed, implied or otherwise given. ONLINE ONLY: This auction will be conducted ONLINE ONLY, the auction has closed and the page remains for information only. PAYMENT: Master Card and Visa will be accepted at this auction up to a maximum of $5,000 per purchaser. Online purchasers will be required to contact our office immediately upon receipt of your invoice to arrange payment by wire transfer or credit card. WE DO NOT AUTOMATICALLY CHARGE YOUR CREDIT CARD. Company checks accepted on site January 22 & 23 if accompanied by a bank letter of guarantee. SAMPLE BANK LETTER: Dear Sirs, (BANK NAME) irrevocably guarantees payment in full to Blackbird Asset Services, LLC by (BUSINESS NAME) drawn on account (NUMBER) up to the amount of $(DOLLARS) to purchase items at the Buffalo Outfront auction sale on January 21, 2015. This letter of guarantee is valid until January 23, 2015. Regards, (BANK REPRESENTATIVE, TITLE, BANK NAME, CONTACT INFORMATION). CATALOG: Please FOLLOW THIS LINK to connect to an ONLINE CATALOG and BIDDING PLATFORM and VIEW MULTIPLE LOT PHOTOS. Please FOLLOW THIS LINK to download a PDF CATALOG AND TERMS OF SALE. INSPECTION: Will be Tuesday, January 20 from 10:00 AM until 2:00 PM or by prior appointment only. Equipment in this online auction is located at 2 Republic Street (corner of Louisiana Street), Buffalo, New York. PLEASE NOTE THERE IS NO HEAT IN THIS BUILDING SO PLEASE DRESS APPROPRIATELY! Please arrange for an inspection with your rigger to make certain that what you purchase will be removed prior to January 31. REMOVAL: Will be Thursday and Friday, January 22-23 from 9:00 AM till 4:00 PM each day, then by appointment ONLY. ALL PURCHASES MUST BE REMOVED BY JANUARY 31 WITHOUT EXCEPTION. Please arrange for an inspection with your rigger to make certain that what you purchase will be removed prior to January 31. Equipment in this online auction is located at 2 Republic Street (corner of Louisiana Street), Buffalo, New York. PLEASE NOTE THERE IS NO HEAT IN THIS BUILDING SO PLEASE DRESS APPROPRIATELY!